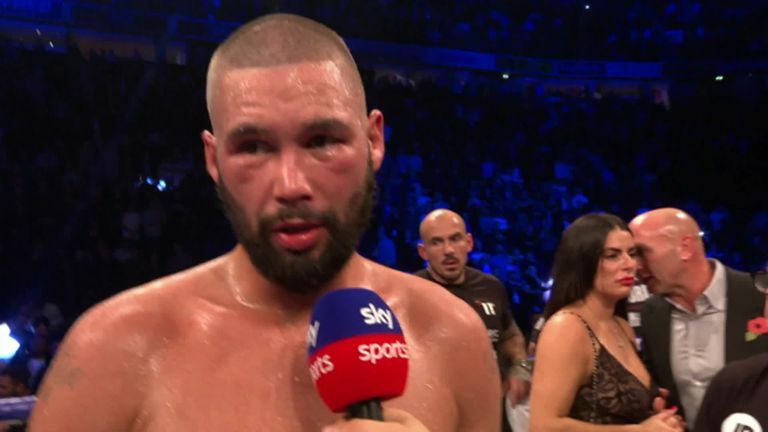 Tony Bellew retires with a record of 30-3-1. Bellew was stopped in the eighth round of his challenge for Usyk's undisputed cruiserweight title in Manchester on Saturday then promised "this is definitely the end" of his career. He said about Usyk: "He's an exceptional fighter who deserves all the awards in the world. I lost to one of the pound-for-pound best. I'm a world class fighter. But that was the difference between world class and elite level. "I have no excuses. He is an amazing fighter. "He is the greatest man I have ever shared a ring with. I wish [him] greatness. "I'm a world class fighter. But that was the difference between world class and elite level." Usyk's 16th pro victory is the latest accomplishment in a stellar career that has accrued an Olympic gold medal, every major belt in the cruiserweight division and the World Boxing Super Series tournament. Bellew was leading on two out of three scorecards at the time of his knockout defeat, and reflected: "I tried to go for it. I tried to get him because I thought I was behind [on the scorecards]. "He's so hard to pin down. Exceptional. "I fought the very, very best. He's just better than me. You come up against great people in life and sometimes you lose, and you have to accept it. "He's slick, he's strong. I have nothing but respect for him. "Anyone that faces him is in a lot of trouble. Only the very best, and the very biggest, will find a way to beat him."